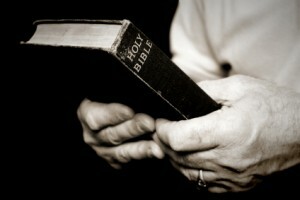 Do you understand what a privileged it is to hold a copy of God’s Word in our hands? Do we comprehend the inestimable value of reading and studying God’s Word? By its own testimony this Book is composed of the very out-breathed words of God Himself (2 Tim. 3:16). The Bible is milk for the immature to grow on (1 Pet. 2:2). It is meat for the hungry to grow into maturity on (Heb. 5:14). It is a hammer to shatter the resistance of our self-will (Jer. 23:29b). It is a fire to consume all that is not worthy of our Master (Jer. 23:29a). It is a double-edged sword that lays bear the deepest recesses of our thoughts and motives (Heb. 4:12). It is a lamp to guide our way (Psa. 119:105) and water to quench our thirst along the journey (Eph. 5:26). This book is truth in a world of deception (2 Tim. 2:15). It is life in a world obsessed with death (John 5:24). It is light for a world groping in the darkness (Psa. 119:130). It is a warning to those who will hear (Psa. 19:11). Many hands have tried to destroy the Bible. Many minds have tried to out-think the God’s Word. Many skeptics have attempted to explain away the Scriptures. Yet the Scripture cannot be broken (John 10:35). It will never pass away (Psa. 19:9). It will stand true and endure long after you and I are gone from this planet (Isa. 40:6-8). Scripture is the plumb-line of righteousness and truth (Amos 7:7-8). It came from the heart of God (2 Pet. 1:21). It lays bare what cannot be seen in any other way (Heb. 4:13). It shines into parts of our being where nothing else can reach (Heb. 4:12). The Scripture is perfect, sure, right, pure, clean, and true. It revives the soul, makes wise the simple, rejoices the heart, gives light to the eyes, and endures forever (Psa. 19:7-9). “More to be desired are they than gold, even much fine gold; sweeter also than honey and drippings from the honeycomb” (v.10). The prophet Amos warned that “days are coming . . . when I will send a famine on the land– not a famine of bread, nor a thirst for water, but of hearing the words of the LORD” (Amos 8:11). It seems that day has come. But may it never be true in the circle of our fellowship! May we drink deeply while we can. May we take stock while we have opportunity to see. May we walk in the light while we have the light. May we grow strong while there is yet food for our souls.